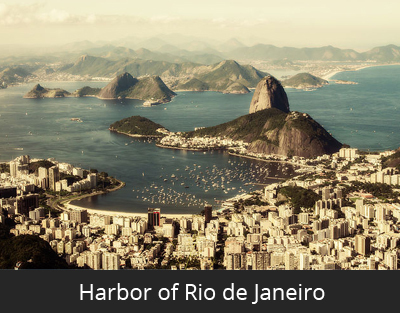 The Harbor of Rio de Janeiro is one of the seven natural wonders of the world. It is also known as the Bay of Rio de Janeiro or Guanabara Bay. It is located in Brazil. It was formed naturally by erosion from the Atlantic Ocean. Rio de Janeiro means ‘River of January’. The bay is named after a river that actually does not exist. Explorers in 16th century thought that they were in a wide-mouthed river. From 1763 to 1960, Rio de Janeiro was the capital of Brazil. Then the capital was changed to Brasilia. The harbor is surrounded by tall mountains that are made of hard granite rocks and a softer rock called Genesis. The harbor was discovered by a group of Portuguese explorers led by Goncalo Coelho on January 1, 1502. It took this group of explorers almost three months to sail from Lisbon, Portugal to the new world. Corcovado is the highest mountain of the harbor. It is 2,300 feet high. The term ‘Corcovado’ means ‘hunchback’. The world famous 98 feet tall statue of Jesus Christ the Redeemer sits on the top of the Corcovado peak. It is naturally set in a balloon shaped bay. The bay is 31 km long. The harbor is the main source of transporting goods and products from different places. The famous naturalist Charles Darwin visited the place in 1932 and he wrote ‘It seemed almost unreal’. The French once held the city of Rio for ransom. The Portuguese governor negotiated it back for 612,000 gold crusades and 100 sugar chests. Street art is completely legal in the city. It is to make the already colorful city an outdoor art gallery. The harbor of Rio de Janeiro has 130 islands and some great beaches like Copacabana, Ipanema etc. Declan, Tobin. " All Facts for Kids about Harbor of Rio de Janeiro ." Easy Science for Kids, Apr 2019. Web. 25 Apr 2019. < https://easyscienceforkids.com/harbor-of-rio-de-janeiro/ >.